Antennas and campers filled the grounds at Willow Creek Intermediate School over the weekend as local amateur radio enthusiasts participated in National Field Day — a fun event that trains for worstcase scenarios. On Saturday, the roar of a gas generator powered seven amateur radio stations for members of the Owatonna Steele County Amateur Radio (OSCAR) Club to demonstrate the science and skill of independent communication without Internet or cellphones. OSCAR works with emergency management and Steele County SKYWARN in training and when responding to emergencies. As part of Field Day, the goal of each amateur radio — commonly referred to as a “ham” radio — operator is to make as many contacts with others across the country in a 24hour period to see how well their setup is performing. The annual event established in 1933 attracts more than 45,000 participants today who, on any given day, can set up in their basement and communicate with people across the world and even the International Space Station. Nordman contacted hams in Ohio, Montana, Arizona and New Hampshire on Saturday, but recalls days when he’s picked up signals in Antarctica and mysterious “number stations,” which are broadcasts of incomprehensible, numerical Morse Code messages commonly believed to be sent by spies. Amateur radio knows no bounds and anything from baby monitors and Walkie Talkies to calls from the Air Force One can be picked up by any ham radio. More than camaraderie and connecting competitions, Field Day reveals the marvel and importance of amateur radio. As the saying goes, “When all else fails, there’s amateur radio.” For example, in 2007, a flood knocked out communication for the city of Rushford in southeast Minnesota. “The only communication into and out of Rushford was amateur radio to Winona,” said Tom Karnauskas, Amateur Radio Emergency Service (ARES) coordinator and Radio Armature Civil Emergency Service (RACES) radio officer for Steele County. Karnauskas said during that natural disaster, ham radio was utilized by emergency crews and families wanting to relay messages to let others know they were OK. On a much larger scale, the same reliance and response goes for disasters such as Hurricane Katrina when the only means of communication was via amateur radio. Unlike cellphones that have towers, ham radio has no central location, meaning a ham can set up anywhere, anytime and make a connection, though it takes proper training and licensure to operate. 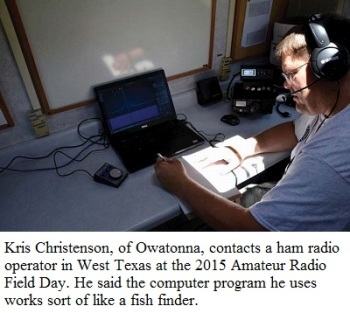 The level of sophistication has grown over the years and some ham radio operators, such as Kris Christenson, utilize laptops where they can send images and type messages rather than communicate the traditional way with just a transmitter and receiver. Christenson said the computer software he was using for Field Day works like a fish finder to make connections. Though just a hobby, he said “there’s a lot to it.” After getting involved with OSCAR 13 years ago, there’s no disconnecting from ham radio in sight. “It’s like a bug you can never cure yourself of,” he said.